Rosetta’s Philae lander has stopped transmitting from comet 67P/Churyumov-Gerasimenko. Philae landed safely, but ended up in a shady location and couldn’t recharge its batteries using solar power. There is some hope that when the comet gets closer to the sun (around August 2015) enough power might be generated to restart the lander’s transmitter, but it’s a long shot. It’s too bad the mission may have ended so abruptly after a 10-year chase, but congratulations to the team for completing an amazing first in space exploration — putting a lander on a 4-mile wide comet moving at over 36,000 miles an hour! 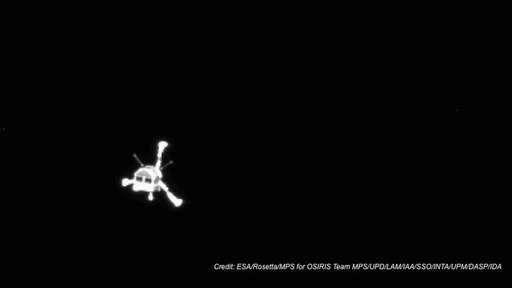 This entry was posted in Space & Astronomy and tagged comet exploration, Philae lander, Rosetta. Bookmark the permalink.